Around Valentine's Day, others may offer candy or treats to your child with food allergies. Make sure your child knows not to accept or eat any candy unless a parent or trusted adult has verified that it is safe to eat. Many candies look similar but can have different ingredients and advisory warnings. 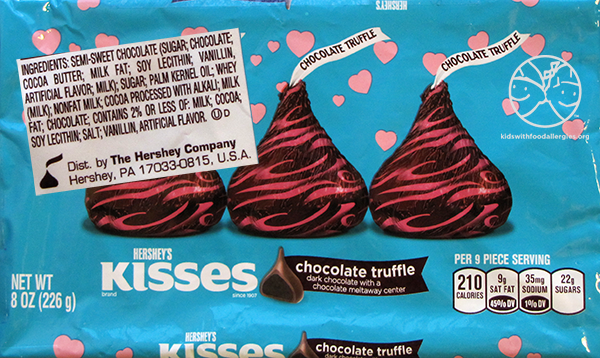 Many smaller candies are sold in larger packages and do not have an ingredient label on the individual pieces. 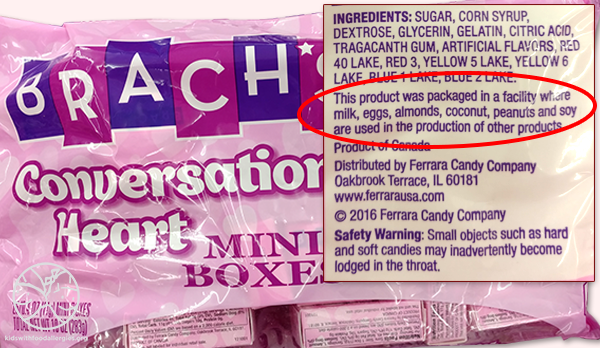 Remind your child to not eat any candy until you can carefully check the ingredient label. If there is no ingredient label, or if the treat is unwrapped, do not allow your child to eat it. Instead, exchange the treat for something safe that you have made or purchased. 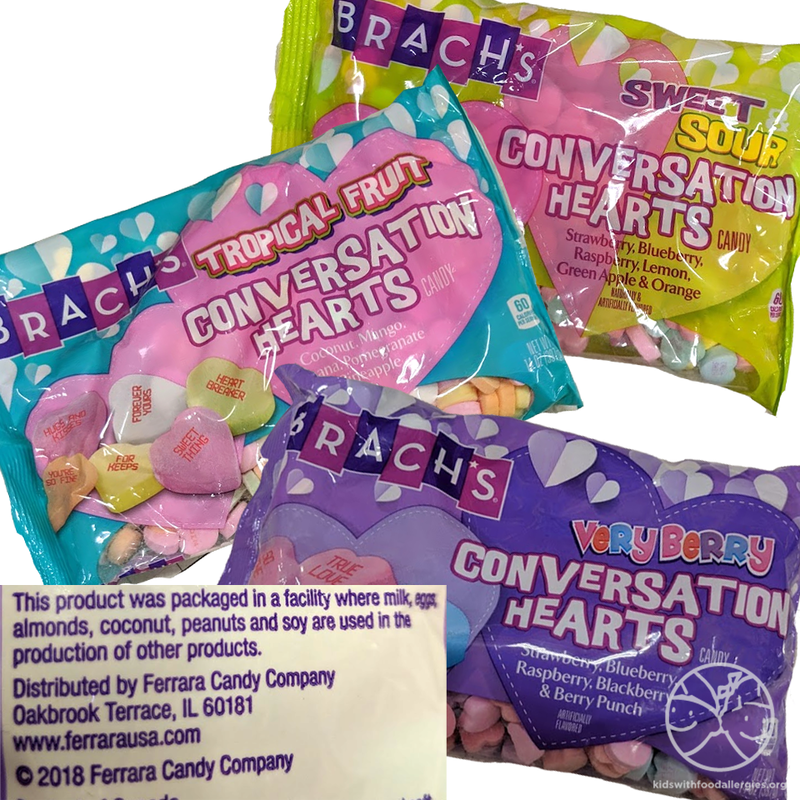 Conversation hearts are often used in lesson plans for Valentine's Day activities. There are different brands that look similar. 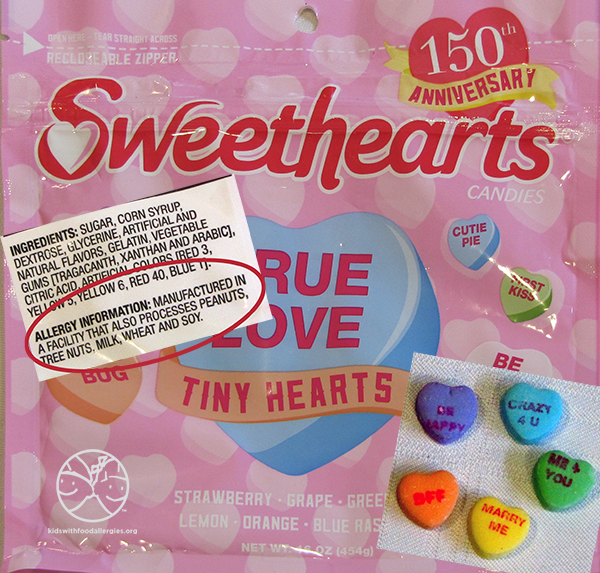 Sweethearts, manufactured by New England Confectionery Co., are not available this year. Brach's Conversation Heart candies, manufactured by Ferrara Candy Company, are manufactured in a facility where milk, eggs, almond, coconut, peanut and soy are used. There are different varieties and flavors including mini boxes, Sweet Sour, Tropical Fruit and Very Berry. All have the same advisory labeling. 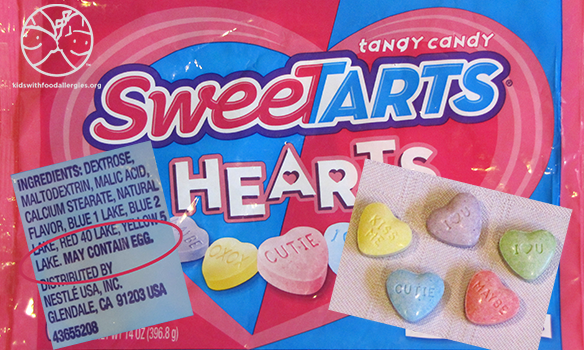 SweeTARTS® Hearts, manufactured by Nestlé®, may contain egg. 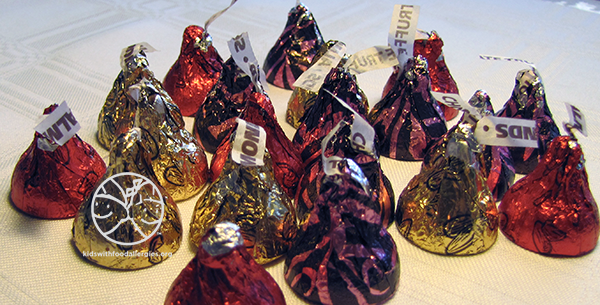 Hershey's Kisses and Hershey's Hugs Kisses come in many different varieties. Some varieties contain almonds and are processed on equipment with other tree nuts. It is often difficult to tell them apart after they are out of the package. 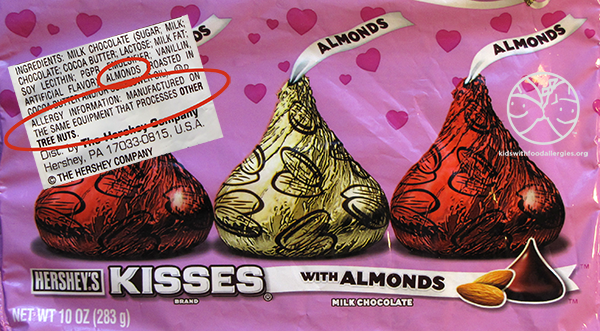 Hershey's Kisses with Almonds contain almonds and, are now manufactured on a line dedicated to almonds. 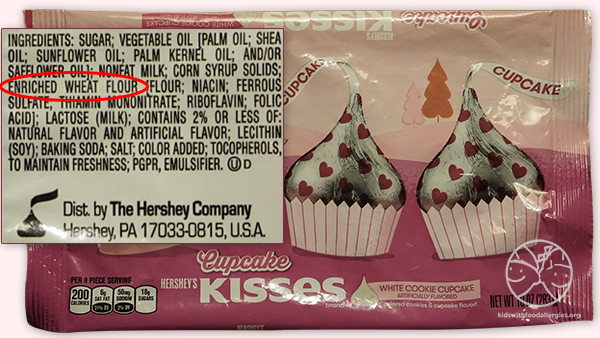 Hershey's Milk Chocolate, Chocolate Truffle Kisses, Milk Chocolate filled with Caramel and many other flavors have no advisory label. 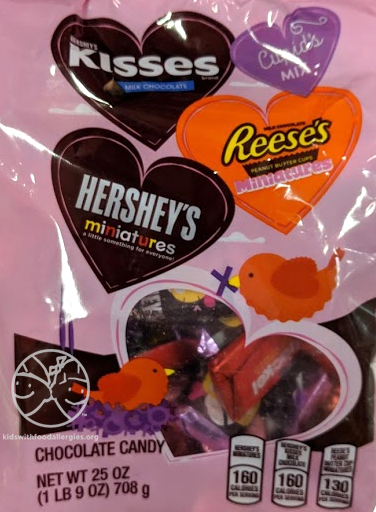 There are Milk Chocolate Kisses in the Cupid's Mix which also includes peanut-containing candies such as Reese's Peanut Butter Cups and Hershe's Miniatures. 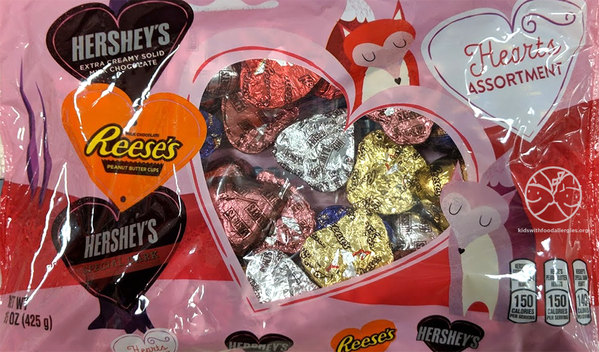 There are a variety of chocolate heart candies available. Most have a similar shape and foil wrapping which can make them difficult to identify once they are removed from their original bag. 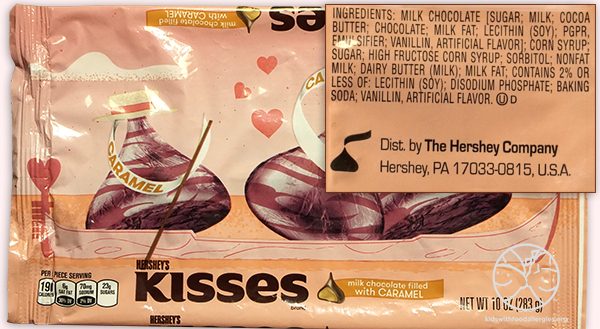 Hershey's Hearts, including Extra Creamy Milk Chocolate and Special Dark, are manufactured on equipment that processes peanuts. Some are packaged with Reese's Peanut Butter Cup hearts. 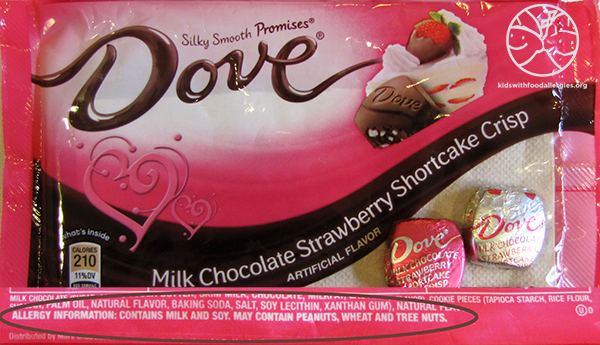 There are several varieties of Valentine's themed Dove chocolates Promises®. 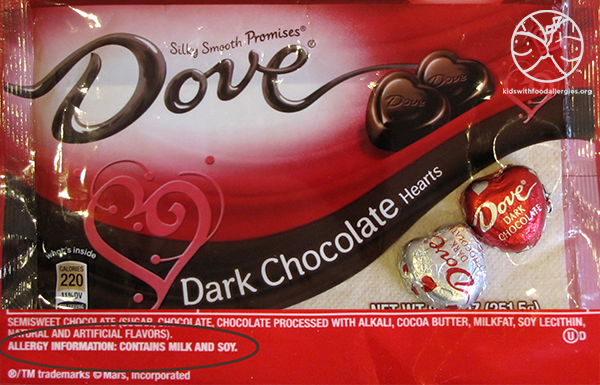 Most, like the Dark Chocolate Hearts, have an allergy warning that they contain milk and soy. 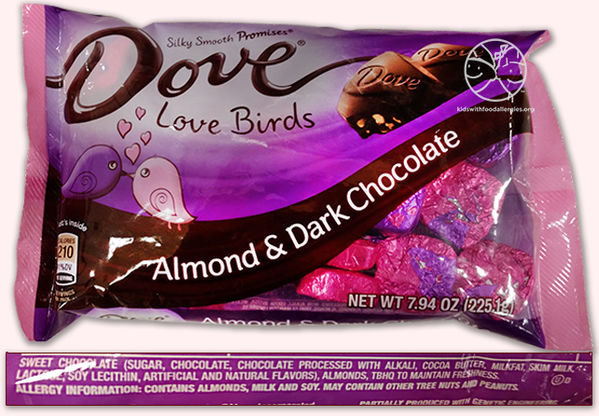 Dove Almond & Dark Chocolate Love Birds contain almond, milk and soy, but also may contain other tree nuts and peanuts. 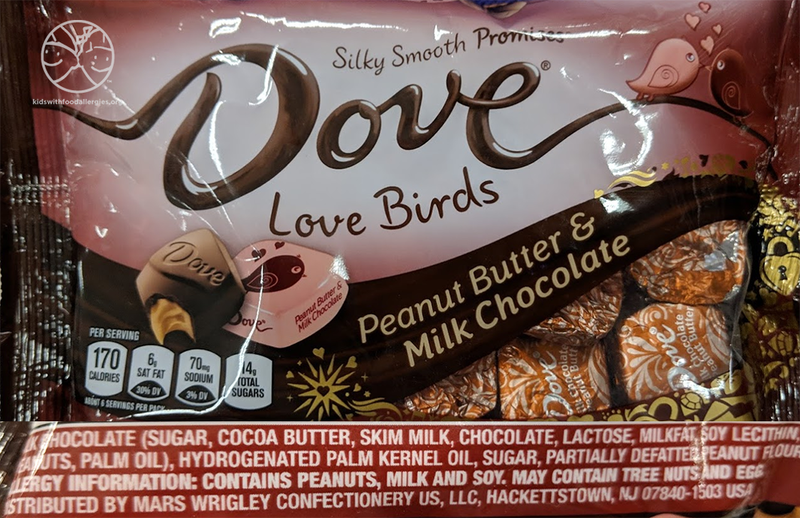 Dove Peanut Butter and Milk Chocolate Love Birds contain milk, peanut and soy. They also may contain tree nuts and egg. You can find certain Dove Chocolates that are manufactured in a facility that does not handle peanuts or tree nuts. 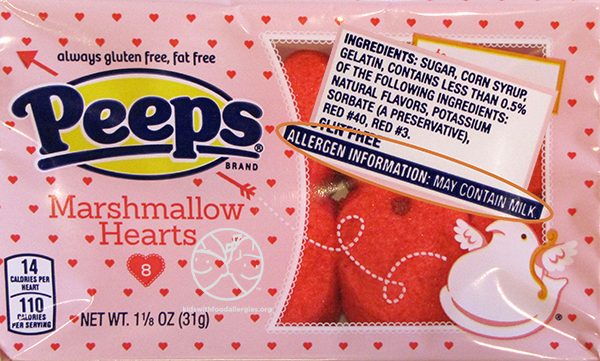 Many varieties of Peeps Marshmallow treats, such as these Marshmallow Hearts, have a may contain milk advisory label. 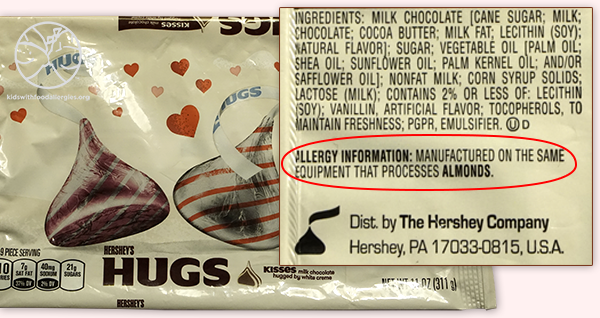 Some products have advisory labeling for additional allergens. Only the marshmallow chicks do not have an advisory warning. Candy and treats can leave kids with food allergies feeling unsafe or excluded. #TealLove means being inclusive of those with food allergies. Find ways to Pledge your #TealLove and focus on sharing non-food gifts this Valentine's Day.